According to Touré, co-host of MSNBC's The Cycle, Tuesday's election boils down to two choices: President Obama, the cool guy who understands your problems but failed to fix them all in four years, and Mitt Romney, the Mad Men-esque guy who might fix your problems but doesn't care about you. But what really worries the journalist is the aftermath of Election Day as the chasm between Democrats and Republicans swells. 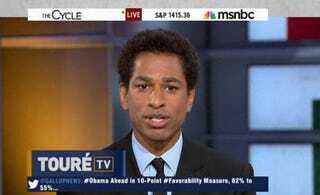 Watch Touré's entire video at MSNBC.